As a relatively small company within the furniture industry we are able to closely monitor the quality of our products and customer service throughout the purchasing process. In order to maintain our reputation as a trusted, customer-centric company, we offer all customers a 1 year guarantee on all our furniture in the rare event of any design or manufacturing related damage. As our customer testimonials underline, we are committed to service and take pride in customer satisfaction and high-quality products. Unlike many of our competitors, if you are not happy with your product or service, you can ring us direct and talk to one of the Lazy Susan team Monday-Friday 9am-5pm to talk through any concerns you may have to ensure you are happy with your product. 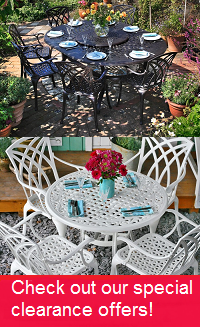 Our maintenance-free furniture is something we believe in so much, all of the Lazy Susan staff have Lazy Susan furniture in their own gardens! "We received excellent advice on the products over the phone, and then were welcomed at the warehouse to see and choose the products. At all times, the staff were extremely helpful and a minor problem was resolved very quickly. The furniture range available at Lazy Susan was by far the best range I'd found anywhere and the quality seems very high. The company is impressive - it's so rare to find a company which seems to get everything right (products, price, service), so I would certainly recommend Lazy Susan to others". "Thank you so much for the service you have given us. 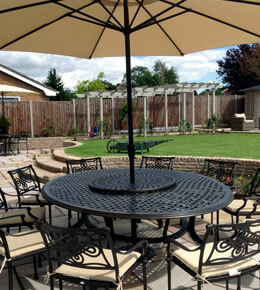 Delivery was prompt and we were very pleased with the table, chairs and parasol. Excellent quality. Lovely free bistro set too!" Kay and Keith Page, Cornwall.